As we create web content, it’s important to keep in mind that to Liferay, the pieces of content are assets, just like message board entries and blog posts. This allows you to publish your web content using Liferay’s Asset Publisher. You can use the Asset Publisher to publish a mixed group of various kinds of assets such as images, documents, blogs, and of course, web content. This helps in creating a more dynamic web site: you can place user-created wiki entries, blog posts or message board messages in context with your content. Let’s look at some of its features. The Asset Publisher portlet is a highly configurable application that lets you query for mixed types of content on the fly. By giving you the ability to control what and how content is displayed from one location, the Asset Publisher helps you to “bubble up” the most relevant content to your users. To get to all the portlet’s options, click the Configuration link in the portlet’s menu (the wrench icon). The ability to configure how content is displayed and selected by your users further demonstrates the flexibility of the Asset Publisher. You get to choose how content is displayed. You can select it manually for display in a similar way to the Web Content Display portlet or you can set up predefined queries and filters and let the portal select the content for you, based on its type or its tags and categories. Let’s first look at how we might select content manually. You’ll see that it’s very similar to the Web Content Display portlet. By selecting Manual from the select box beneath Asset Selection, you tell the Asset Publisher that you want to select content manually. You can select what you want to be published within the portlet, or you can create new content from within the Asset Publisher. Figure 5.12: Selecting assets manually is very similar to the Web Content Display portlet, except you have many other content types to choose from. Clicking Add New gives you a menu of options, enabling you to create the content right where you are. 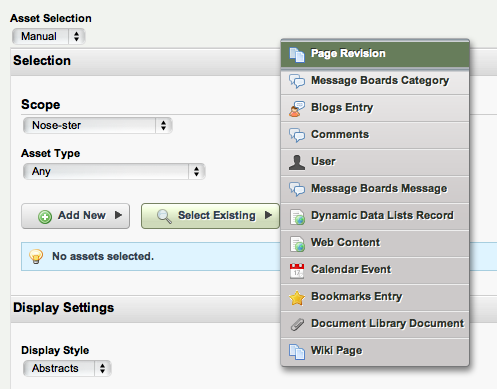 You can create blogs, bookmarks, calendar entries, documents, images, and of course, web content. Anything you create here is added to the list below of assets that are displayed by the portlet. Clicking Select Existing gives you a similar menu, except this time you can pick from existing content in the portal that either you or your users have created. Has someone written an excellent wiki page that you want to highlight? Select it here, and it will be displayed. The Asset Publisher enables you to mix and match different content types in the same interface. Once you have your content selected, you can move on to the display types to configure how the content appears. Most of the time, however, you’ll likely be using the Asset Publisher to select content dynamically. Scope: Choose the scopes from which the content should be selected. This can be either the scope of current site, the global scope, or both. Asset Type: Choose whether you’ll display any asset or only assets of a specific type, such as only web content, only wiki entries, or any combinations of multiple types. 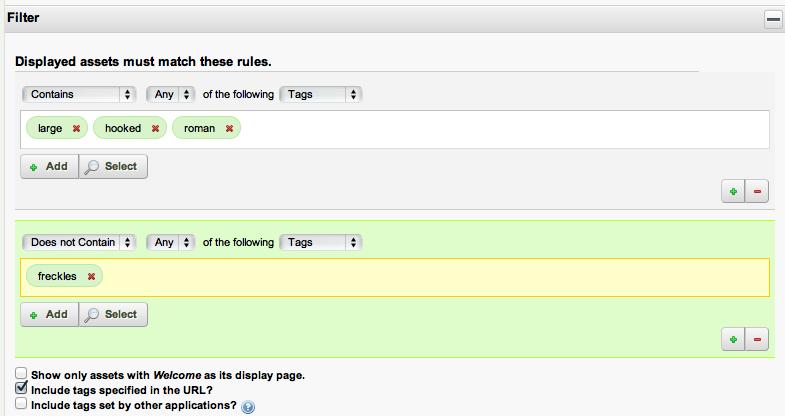 Figure 5.13: You can filter by tags and categories, and you can set up as many filter rules as you need. Filter Rules: Add as many filters on tags or categories as you like. You can choose whether the content contains or does not contain any or all categories or tags that you enter. Once you’ve set up your filter rules for dynamically selecting your content, you can then decide how the content will be displayed. The Display Settings section gives you precise control over the display of your assets. There are a multitude of options available to configure how you want your content to appear. You can configure the style, length of abstracts, behavior of the asset link, maximum items to display, pagination type and file conversions. Additionally, you can enable printing, flags, ratings, comments and comment ratings, and these work the same way they do in the Web Content Display portlet. You can display the content returned by the filters above in order by title, create date, modified date, view count and more in ascending or descending order. For instance, you may have a series of “How To” articles that you want displayed in descending order based on whether the article was tagged with the hammer tag. Or, you may want a series of video captures to display in ascending order based on a category called birds. You can also group by Asset, Type or Vocabularies. Vocabularies are groups of categories defined by administrators in the Categories section of the Control Panel. In the Ordering and Grouping section of the Asset Publisher, you have great control over how content is ordered and grouped in the list, but this is only one aspect of how your content will be displayed. You can refine the display through many other display settings. Note: The following actions will have immediate effects in your Asset Publisher: - Change the value of the Asset Selection option. - Change the value of the Scope option. - Select, add, sort or delete asset entries (only when selecting assets manually). Other changes in the rest of the options will come into effect after clicking Save.